MF Fire was featured in Founder Taylor Myers’ home town paper, The Catoctin Banner. Imagine having a wood stove where all you needed to do was add wood and throw in a match? The stove would then take things from there, getting the fire going and keeping the room where the stove is located at just the right temperature, as well as burning the wood so efficiently that there is only a tiny amount of wood left. The Catalyst electric wood stove is just that and more. Read more over at the Catoctin Banner’s website, here. Our hometown is proud of the progress that MF Fire has made in the past year. It recently featured our journey in a nice article in the Frederick News Post. Co-founders Taylor and Ryan were both born and raised in Frederick County, Maryland, graduating from Catoctin High and Middletown High, respectively. Since graduating, the two founders attended the University of Maryland for engineering and developed the cleanest, most efficient wood stove on the market. It uses combustion techniques to create The Perfect Burn, regulating the temperature digitally and burning off excess soot along with it. As a result, our high-efficiency wood burning stoves are easier to operate, better for the environment, and require much less maintenance than any wood stove in production. This is a timely innovation, as wood is a growing source of heat in the US. In Frederick County specifically, 2,792 households reported using wood as a heating source in 2014, ranking it fifth in popularity. The majority of county households — about 42,935 — reported using electricity as a heating source, followed by utility gas and fuel oil or kerosene, according to the Census Bureau. To read more, visit the FNP here. Starting Monday, May 16th 2016 small companies and startups can raise as much as $1 million online from ordinary investors in a 12-month period. MF Fire and our modern wood burner will be one of those companies. Until now, federal securities laws allowed only wealthy individuals, or so-called accredited investors, to participate in such offerings. The new fundraising option stems from the 2012 Jumpstart Our Business Startups Act, or JOBS Act. Under the rules, individuals with income or net worth of less than $100,000 can invest the greater of $2,000, or 5% of either their annual income or net worth, whichever is lower, in small-scale securities offerings in a 12-month period. Investors with income and net worth of at least $100,000 can invest up to 10% of their annual income or net worth, whichever is lower. Read a bit more in the Wall Street Journal below. “University of Maryland alumni-founded startup company MF Fire, which has been working to commercialize the 93% efficient, almost emission-free Mulciber wood stove, took 2nd place in the national RECESS Pitch competition, held in Las Vegas in late May. Read the full article about our electric wood heater here. The creators of the Catalyst stove were honored for innovation. Read more about our EPA approved wood burning stove in the Daily Record here. GVH Live, an online media organization providing news targeted at millennials, profiles founders Taylor Myers and Ryan Fisher as part of their campus innovators series. The campus is University of Maryland. The innovation is the Mulciber stove, now renamed the Catalyst. This stove is digital, allowing the operator to adjust the temperature from his or her smartphone. The stove is also efficient – the most efficient stove on the market. Watch them talk about our efficient wood heater here! The following is an excerpt from an article that once appeared on the University of Maryland Diamondback news about our energy-efficient wood stove heater. The article has since been removed from the website as it underwent a domain change & archiving process. “Last week, a university team traveled to the National Mall to compete in the Wood Stove Decathlon, earning the top prize in the particulate matter emissions category. The event pitted 12 teams against each other from Nov. 15 to 19 and tasked them with building wood stoves. The engineers who made up the teams ranged from employees of established companies to small-time inventors. This university’s team was the only student group. Today, the Mulciber wood stove heater has been renamed the Catalyst Wood Burning Stove, the safest, cleanest, and most efficient stove available on the market. The Capital News Service profiles the University of Maryland (UMD) student team at the 2013 Wood Stove Decathlon. Watch the video of how the team “heats up the Mall” with our highly efficient low-emission wood burning stove here. The New York Times profiled the 2013 Wood Stove Decathlon, a contest that aims to find ways to “get twice as much heat out of a log of firewood”. The University of Maryland was just one of twelve teams competing to define technology for clean-burning wood stoves. This contest is important because 2.3 million American homes rely on wood as a primary source of heat. A typical wood stove can deliver 40-50% of the energy potential of the wood, but the competitors of the Wood Stove Decathlon are achieving 90% or more in their clean-burning wood stoves. Our team went beyond the approach of merely installing a catalytic converter, similar to how vehicles operate. The article explains: “The stoves use clever innovations. Traditional stoves pull in cool air, but a team from the University of Maryland put the air intake pipe inside the exhaust pipe, an arrangement that heats the inlet air and cools the exhaust, thus conserving heat and improving efficiency. Their stove, a prototype built partly by the machine shop at the university’s College Park campus, uses a fan to draw in air. A small computer controls the fan, varying its speed to keep the temperature in the firebox in the proper range. It goes on to explain how the stove, now called the Catalyst Wood Burning Stove, doubles down on efficiency: “In a twist, the electricity to run the computer and fan comes from a thermoelectric generator, driven by the heat of the stove. For production models, the thermoelectric generator will allow the user to recharge a cellphone.” Read the full article here. The result of this competition are stoves that not only meet the more strict efficiency standards required by the EPA, but also make operation easier and safer for the typical homeowner. Since the competition, that team has continued to seek The Perfect Burn, bringing to market the best clean-burning wood stoves available.It even regulates the temperature using a smartphone app. They’ve come a long way since the New York Times profiled them, and we can only expect more innovation ahead. National Geographic – Wood Stove Decathlon Underdogs? In 2013, we were just students at the University of Maryland. 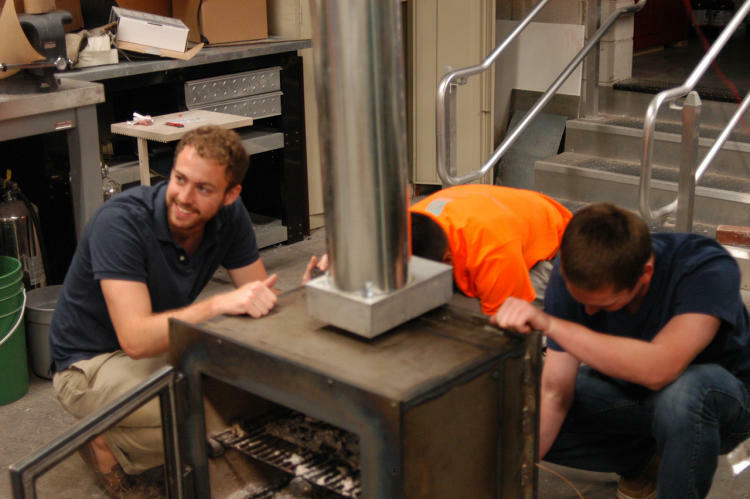 Our team of engineering students entered the Wood Stove Decathlon, a contest designed to spur innovation for the product. At that time, we were underdogs, representing the only University among several large companies. National Geographic profiled us anyway. In the video, you can see us working on the first version of the Mulciber stove, now renamed the Catalyst. Our goals were to create something that is easy to use, costs less, and is more efficient than anything on the market currently. Our team was composed of excited students who were eager to put their education to use by creating a super efficient wood stove. As shown in the video, our super efficient wood stove even generates more electricity than it uses, and that excess is used to power the fan and other components of the digital stove. Sounds like a team of more than just underdogs.